Martin Black, author of G.L. 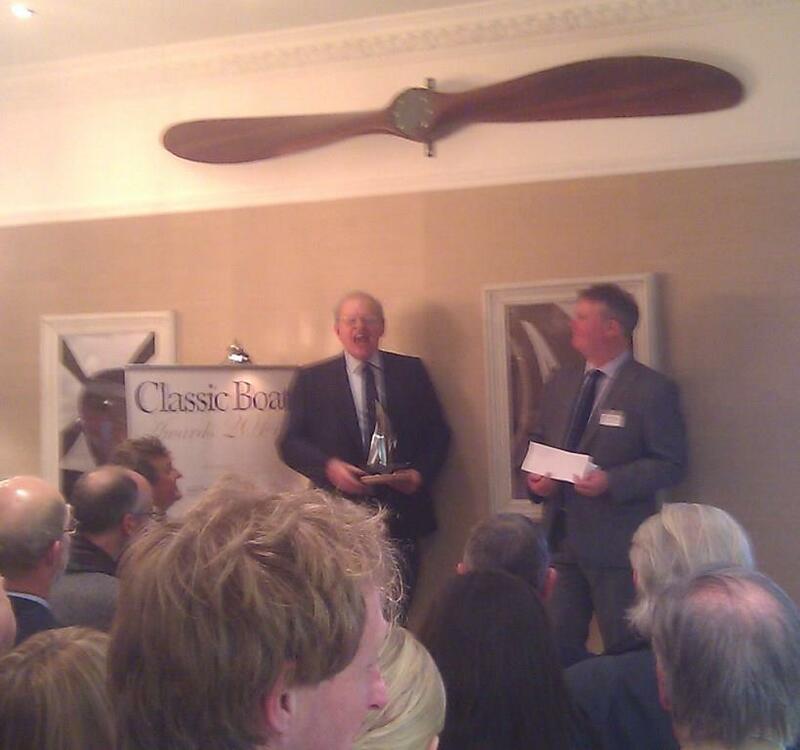 Watson – The Art and Science of Yacht Design, was tonight presented with the John Leather Award for Special Achievement at the 2014 Classic Boat Magazine Awards event in Mayfair, London. 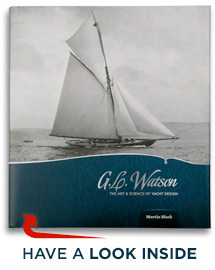 It’s the first time this prestigious award has been presented for something not directly related to hands-on traditional boat work – a fitting tribute to Martin for a very special publication: meticulously researched over many years and written with care; brought to fruition by a team gathered by Peggy Bawn Press owner Hal Sisk, and given its great presence via the high typographical and production values of Gary Mac Mahon’s Limerick, Ireland based Copper Reed Studio. 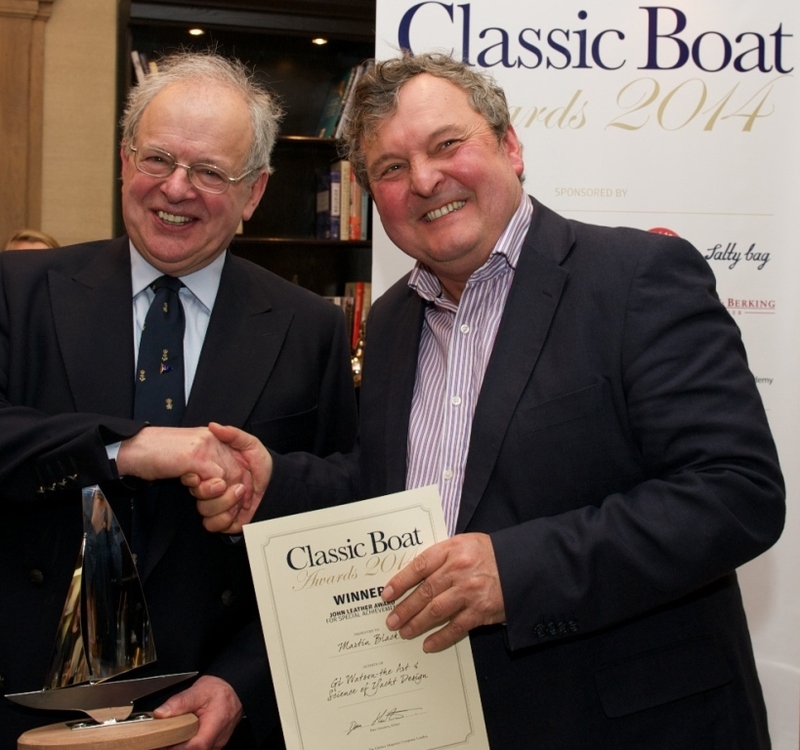 [Update 12 March, 2014: Courtesy of Classic Boat magazine, here is the official award ceremony photo of Professor Mark Horton of Bristol University – but better known as one of the presenters of BBC2′s Coast programme – presenting Martin Black with the John Leather Award for Special Achievement at the 2014 Classic Boat Magazine Awards event in Mayfair, London. Martin Black (left) receiving the John Leather Award for Special Achievement from Mark Horton. This entry was posted in America's Cup, art, Big Class, boatbuilders, boatyards, book, Britannia, Clyde yachting, Clydebuilt, Firth of Clyde, G.L. Watson, G.L. Watson & Co., gift, Glasgow, leather-bound, Lifeboat, limited edition, Martin Black, object of desire, photography, River Clyde, RNLI, shipbuilding, shipyards, Steam Yacht, tank testing, yacht design, yacht designer, yacht racing, yachting history and tagged Classic Boat Awards 2014, Clyde-built, Dan Houston, gift, Hal Sisk, Shamrock II, Sir Thomas Lipton, Thistle, Valkyrie II, Valkyrie III. Bookmark the permalink. A very well deserved award for a huge effort of scholarship. Thanks Ewan, especially on behalf of Martin. Thanks Donal, have passed on to Martin.